They're just baby teeth, right? “But they are only baby teeth; won’t they just fall out?” Our team at McCreary Family Dentistry has had these questions asked many times from parents over the years. Primary teeth, or “baby teeth,” will indeed come out eventually, to be replaced by permanent teeth as the child grows and develops. These teeth serve a great purpose as the child continues to develop and require specific care. 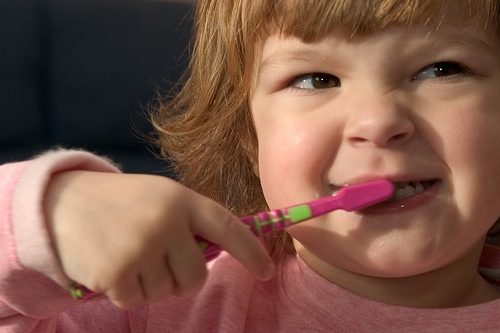 Because baby teeth are temporary, some parents are unenthusiastic about fixing cavities in them. This may be due to the cost or having to force a child undergo the process—especially having to receive an injection. But if a cavity is diagnosed early enough, an injection can often be avoided. More important, failure to fill cavities in primary teeth when they are small and manageable can have lasting consequences in cost and health concerns. Serious illnesses in children have been diagnosed which began as a cavity. Primary teeth act as a guide for permanent teeth. When decay reaches the nerve and blood supply of a tooth, this can cause an abscess. Severe pain and swelling may result. At that point, the only treatment options are either to remove the tooth or to perform a procedure similar to a baby root canal. When a primary tooth is lost prematurely—to decay or a painful abscess—the adjacent teeth will often shift and block the eruption of a permanent tooth. Braces or spacers become necessary to avoid crowding or impaction of the permanent tooth. There is nothing more heartbreaking for Dr. James McCreary than to have to treat a child experiencing pain and fear. To all the parents of my little patients our team strongly recommend filling a small cavity and not waiting until it becomes a larger problem such as those described above. Prevention is the key to a healthy mouth for our smallest patients. Parents should allow the child to brush his or her teeth using a pea-sized amount of fluoride toothpaste and then take a turn to ensure the plaque gets removed from all surfaces: cheek side, tongue side, and chewing edges of all the teeth.